Tritto’s sparkling debut novel succeeds as a gripping tale of one man’s self-discovery. 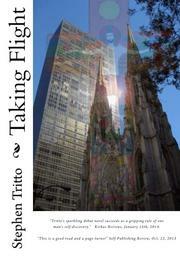 Tritto, a veteran short story author, tells the story of Anthony Bartolo, a product manager for a high-tech firm. He and his wife, Bernadette, a buyer for an upscale department store, are DINKs—dual incomes, no kids—living well in the suburbs, as are the couples with whom they socialize. By most standards, Anthony should be content, but he still feels unfulfilled—a good thing, narratively speaking, since these characters are fairly unappealing early in the novel. Then life throws some changes at the Bartolos and their friends. Anthony is blindsided when he loses his job, which leaves him casting about for what he wants to do with his life. Such ruminations could come off as whiny, but in Tritto’s capable hands, Anthony blossoms. A member of their group dies while doing charitable work in El Salvador, and Anthony, the only one with time on his hands, volunteers to retrieve his remains. In fact, he selfishly does so without consulting Bernadette, further threatening their crumbling relationship. Anthony’s worldview changes once he lands in the Central American country, which is populated by believable characters, including his guide, Col. Juan Hernandez, a former rebel leader who serves as security for Anthony during his trip. While Anthony jumps through bureaucratic hoops in order to take his friend home, he learns to appreciate the ways of El Salvador while navigating its dangers and tragedies. Anthony arrives in El Salvador as a well-meaning but sometimes-ugly American, yet he comes back a changed man, bearing precious cargo: not only his friend’s body, but also a secret from his friend’s other life. Anthony doesn’t know what he wants to do, but he knows he doesn’t want his old life. Tritto helps Anthony evolve from a self-absorbed yuppie to a man more empathetic to those around him, a man readers can root for even if he still doesn’t truly know himself. A novel that artfully spans two cultures, from a talented new author ready to take wing. ITALY FROM I TO Y?